The Route of Santiago de Compostela comprises over 1800 historic buildings on the Christian pilgrimage route to the Cathedral of Santiago de Compostela. The Route starts from the French-Spanish border, at either Roncesvalles or Canfranc. 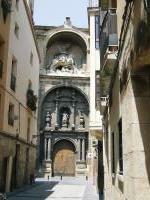 Legend has that the remains of the apostle Saint James the Great are buried in the Santiago cathedral. His tomb was discovered in the 9th century. Pilgrims from all over southern Europe started flocking there in the 10th century. The pilgrimage became so popular in the 12th that it even got its own guidebook, Book V of the Calixtine Codex. The buildings on the Route consist of cathedrals, churches, monasteries, hospitals, inns and public works in 166 towns and villages. One should only be allowed to tick this WHS off, if you’ve walked enough of the pilgrimage route to earn your compostela certificate! That is: having walked or rode horseback at least the last 100km, or cycled the last 200km. For my part, I have to admit that I haven’t reached Santiago de Compostela. Even not by car. After having visited Las Médulas in the morning, I decided that it would be too far to drive on to Santiago. So I went to Astorga instead, one of the major stops on the Route. Astorga has two very fine works of architecture: the Episcopal Palace designed by Gaudí, and the Gothic Cathedral. Both are named specifically in the AB evaluation, so I guess it’s kosher to visit these buildings as representations of the works of faith and art that make up this WHS. The Gaudí Palace looks like a church, and now has a museum inside. The exhibition didn’t really do something for me, but it’s also a fine way to admire the architecture of the building from the inside. It was inspired by the rooms full of arches in the Mezquita of Cordoba. It has the same red/white striped pillars, and stained glass windows. I didn’t get into the Cathedral (closed), but its façade is very much worth checking out. It is extremely flashy! I did not encounter many ‘pilgrims’ in Astorga or on the road, certainly not on foot. I do wonder however what it is like to walk this Route. It does look very hot in July/August, and there also seem to be boring parts through industrial areas. And it is far, very far: 656 km from the French border to Santiago de Compostela. Maybe I have to read a detailed first hand account on it first, before I’ll embark on this once-in-a-lifetime experience myself. I visited this WHS in April-May 2016. I walked the Camino Frances from St Jean in France to Santiago de Compostela in 32 full walking days (775km). Walking from France, I missed the Somport pass which would take slightly more time. A lot of planning and mental training/endurance was required to complete this pilgrimage/WHS but I managed to fulfill my vow. First of all, I had to sacrifice a year's worth of leave to have enough time for the longest Camino. Secondly, I opted to walk in Spring which is by far less crowded/cooler but at the same time I had to bring a windbreaker jacket with me. In hindsight, this was a crucial decision as most probably I would not have completed the Camino Frances had I opted for summer (not only because of the heat especially across the meseta, but mostly because of the huge surge of pilgrims). Already towards the beginning of May, I walked by a couple of villages with no room/bed available in any albergue by 14:30 (the film The Way has drastically increased the number of North Americans!). To me the whole outstanding universal value of this WHS and/or pilgrimage is that there is no destination/landmark/monument which is worthy alone of such an effort. It is the whole route in itself that is truly outstanding as every pilgrim's experience and interaction with nature or with other pilgrims is unique and enriching. For example, in the last 150km, there are no major cathedrals/churches/chapels for a specific reason ... so as not to outshadow the cathedral of Santiago de Compostela (which is really not worth the 775km if prime importance were to be given solely to the destination). Moreover, the last 100km and the last 250km for bikers/pilgrims on horses have become quite touristy, being marked every 100 metres and sometimes with dustbins and signage which is non-existent in the first 300-400km. Numbers increase exponentially after Sarria as the Camino del Norte meets the Camino Frances but mostly because the majority go for the last 100km to qualify for the compostela. In my opinion, this section is nothing more than a long hike and you won't need any big backpack or sturdy hiking shoes if your fitness is average. For the whole Camino Frances, these are essential and a bit of running-in will significantly reduce the amount of blisters in the first kilometres. Good socks and regular breaks will help prevent blisters too but honestly they are truly inevitable if your fitness is average. I suffered my first blisters after 300km but after a day or two you'll get used to them (and you'll definitely find all the Compeed you need at the well-stocked pharmacies along the way). My favourite part of the Camino Frances in terms of nature was definitely the final part of the Route in France and the beginning of the Route in Spain. The natural landscape changes quite frequently before reaching Logrono and the colours are breathtaking in any season. My favourite stretch along the Route in Spain in terms of historical/archaeological/cultural remains was the Arte Romanico from Navarra to Leon. The Cathedral of Burgos is a WHS on its own so I'll review this later. The Cathedral of Leon is mostly famous for its splendid stained glass (quite similar to Chartres in France). However, the minor churches of Martín de Tours in Fromista and that of the Holy Sepulcre in Torres del Rio, together with the short detour to Santa María de Eunate from Muruzabal could easily qualify as a WHS series in their own right. Moreover there are endless amounts of bridges which vary in size, shape and form. Two worth mentioning are the one in Puente la Reina and the longest one in Hospital de Orbigo. Apart from the monasteries of Suso and Yuso which are a seaparate WHS, great monasteries which were either on the route or worth a short detour were the Monastery of San Zolio in Carrion de los Condes and the Monastery of Samos. Walking for days on end under the incessant rain or under the scorching sun to these places is truly a once in a lifetime experience as you can easily understand how pilgrims must have felt when walking the Route a couple of hundred years ago. The only annoying factor during my Camino experience was the avoidable 'race' bug which affects a number of pilgrims. Since the cheapest (or those with a donativo!) accomodation gets filled up first, some went against the only basic 'rule' of the Camino - DO NOT RUSH. After a while I could easily identify who had planned with advance bookings (cancellable till 17:00 on the day of arrival) or those who did not book stating that they preferred to walk freely but who unknowingly adopted a routine of waking up very early at 5-6am (waking up other fellow pilgrims) and rushing to arrive at a given albergue by 1pm to queue and secure a bed. Some skipped stopping at some of the above mentioned places simply because they were in a hurry; which to me goes against the whole idea of the Camino. Apart from that, I wouldn't mind embarking on another shorter Camino in the future. For those who can't take a month's worth of leave, you can always divide the Camino Frances in different stages and do the whole Camino Frances over a number of months/years. Apart from the compostela in Latin, in Santiago you can pay 3 euros to get the distance compostela which states the starting point and the amount of kilometres, while in Sahagun you can get the half way compostela. 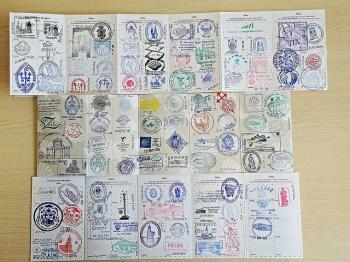 The best souvenir in my opinion are the stamped credencials (picture). The Route of Santiago de Compostela in Spain UNESCO plaque (in Galician) can be found in Santiago just before entering the old town. For anyone who wants to truly experience some of the highlights of Spain or Europe altogether, the Camino Frances and the Camino del Norte offer a great opportunity of visiting a whopping 13 WHS while enjoying a truly unique experience. Along the Camino Frances I had the time to visit 5 WHS (as I had already visited 3 nearby sites) and then after my 1070km pilgrimage (including sightseeing) I rented a car to visit another 3 WHS in Galicia and Asturias. All in all, I feel that this WHS is the best out of the 3 linked to Santiago and the whole camino is still very much alive among the locals even as far as 600km away from Santiago. This site is emblematic of the question of what does it takes to tick off a site (does this one counts ?). It is a route (el camino) about 700 km long, from the French border in the Pyrenees mountains to the cathedral of Santiago de Compostella. The site boundaries includes the entire 700 km or so of camino and extend from 3 to 100 meters on both sides of the camino. It also includes about a few hundreds of associated monuments close to the camino. Traditionnally, the pilgrimage needs to be done by foot, bicycle or on horse. To be validated, the pilgrims need only to cover the last 100 km, or 200 km on bicycle, and then recieve the compostela (the pilgrimage certificate). Most people walking or cycling the camino nowadays are not religious. They do it for meditation, adventure or just for fun vacations. I decided that I needed to complete the 700 km in order to tick off the site. Lacking time, I decided to cycle the route. I rented a bicycle in Roncevalles (the first village after the French border) and cycled all the way to Santiago. It took me 11 days, during which I almost didn't leave the boundaries of the site. 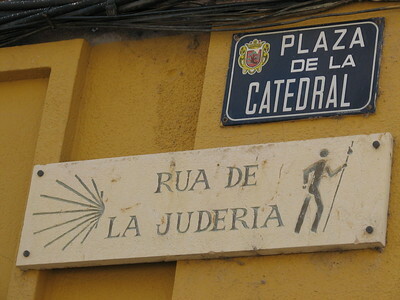 The camino is well indicted with yellow arrows or scallop painted on walls, stones or trees. A detailed map is therefore not necessary. It follows all kind of differents tracks, dirt roads or concrete roads, but all efforts are made to avoid cars. Every few kilometers is an albergue, a pilgrim's rest, with huge room of bunk beds. Not very confortable, but very cheap (from donation to 10 euros). There are several paradores (luxurious hotels in historic buildings) however. Every few kilometers are shops or pubs for food. I strongly recommend doing the Camino, either walking or cycling. It is a completely different kind of vacation, with long days of effort, with many differents landscapes, from desertic plains to high hilly and rainy mountains, from nice little village to big medieval cities. Walking is a great way to meet people, either on the route during the day, or in albergue in the evenings. It is safe to walk alone, as in almost no place you will be left alone for long. Cycling is a more lonely alternative. It is also a very strange feeling to strictly stay within a WHS boundary for so many days. Along the way, or close to it, is Atapuerca, Burgos, Yuso and Suso monasteries. A bit further is Las Medulas, Lugo and Tower of Hercules. Arrival in Santiago after so many days of pilgrimage route is magical and adds another tick-off, as Santiago is a separate World Heritage site. If you need a bicycle, I recommend bicigrino.com, for one-way rental from any point on the camino to any other point. So far, the Camino was the hardest site to tick off. 11 days, about 700 km, two long rainy days, two big passes to climb, one flat tire, a pair of shoes ruined. But also so far one of the most rewarding site. 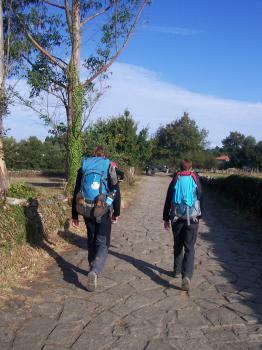 It was about 5km outside of Sarria that I spoke to my first proper Pilgrim, or Perigrino as they are locally known. I was feeling pretty good having decided to walk the last 120km of the Pilgrimage Route to qualify for my Compestela and properly ‘tick off’ this world heritage site. We walked on talking, we passed a few full pilgrim hostels before eventually finding one with space. We ended up having to share a double mattress on the floor in a room crammed with 30 other perigrinos. Later settling down to a rather limp looking steak, I talked about how there was no hot water in the single shower for all 30+ of us. And this was how life progressed for the next 3 days. Endlessly meeting and talking to a huge array of people; each with their own reasons for doing the Pilgrimage; some wanted a break from everyday stresses to sort out their direction in life; some for religious reasons and many just wanted to walk for the experience. I met and spoke to people from all over the world, but liberal European holiday allowances and the location meant that there were a lot of people from across the continent, but there were also a very healthy array of people from further afield. The official website has some interesting statistics on who walks the camino and from what starting points. I am not an especially religious person, and not catholic, so the sacred nature of the walk was not so important to me, however it was an exceptionally interesting way to spend a few days. The WHS itself is currently just the Camino Frances, but it would make a lot more sense if other routes were incorporated into this inscription, especially the original Caminos 'del Norte' and 'Primitivo'. Incorporating the routes across Europe would also seem to be a highly logical step, and show this as an exceptionally cohesive entry, rather than somehow suggesting that the Route in France is manifestly different, as is currently suggested by the separate inscriptions. In terms of sights along the route the main points of interest are mostly bridges and churches, the finest I saw on my short stretch was Santa Maria in Leboreiro which had some impressive frescos. Occasionally the accommodation is of a distinct vintage; my favourite pilgrim hostel was in the hamlet of Ribadiso do Baixo. I wasn't planning to stay there but a sudden downpour mixed with idea of staying in the recently renovated 14th century Hopistal de St Antón, made up my mind for me, it felt like I was truly getting the experience that I had come for, a bottle of Galician Albarino and the company of some Belgians just added to the enjoyable atmosphere. I would thoroughly recommend walking some of the route, even if it is only a few km. Walking from Monte de Gozo (like Fredrik below) would be a good idea, unfortunately the route is not so great as you mostly walk through the sprawling suburbs of Santiago. If you had a day to spare and a good pair of shoes then you could try a longer walk from Arca da Pino/ O Pedrouza. It is about 22km and goes through some nice eucalyptus groves, before climbing up to Monte de Gozo to give a first, but slightly cluttered, view of Santiago, it is a route that is fairly representative of the last 120km of the walk. Just remember to say 'Buen Camino' to those that you walk with and you can be as quiet or talkative as you like. In terms of logistics the Camino Frances is very well marked for the last 150km with every single turning marked with a yellow arrow. Further from Santiago it is still well marked but not quite as extensively. A map is perhaps not essential, but a list of accommodation on the route and how far it is practically essential. I would give a recommendation to the well written download at caminoguide.net. Accommodation is pretty basic, the best you will get in Pilgrim hostels is similar to a good quality youth hostel, the worst can be just mattresses piled into a 'bed-castle', but they are cheap ranging from free- €10 a night, with municipal ones all priced at €5 (2010). The only other essential pieces of kit are a sleeping bag and a good pair of shoes. Another useful resources I found is: www.caminodesantiago.me.uk. The forum I found exceptionally useful. This was an exceptionally rewarding trip for me, and quite different from other visits to WHS. On returning I am very keen to walk more of the route, next time I will certainly allow for a longer period of time to walk, a couple of weeks would give a much better introduction to camino life. Jaca, the cathedral, ayuntemento, citadel and St Michael's Bridge. My Spanish friend told me that “walking on the Camino de Compostela in whatever length is always special and good for you!”. From his words I decided to make a pilgrimage to Santiago de Compostela, but I did not want to walk from Spanish border to Santiago de Compostela in Galicia which will consume a lot of time and faith that I did not have much. As my friend said “in whatever length is always special!”, I chose to walk from Monte do Gozo (Mount of Joy) to Santiago de Compostela which is the last section of the Camino and maybe the most important part for many pilgrims. Monte do Gozo is the hill outside Santiago de Compostela providing a first view of the city with the spires of the cathedral, the end of the route. Reportedly that many pilgrims cried with joy when they reach this place, but as my visit was in winter there were no pilgrims at all just a hill with a big sculpture that built to commemorate the visit of the Pope to this holy town. Also I could not see the spires of the cathedral as most people claimed! From the hill, I had walked back to the town until I reached the square with the great cathedral. The cathedral is very beautiful and deservedly to be the end of the route. The interiors are very rich with details, and the golden altar of Saint John is just amazing and I believe these will make all pilgrims quite happy to see this spectacular place after their long journeys. As I tried the Camino experience for just less than 7 kilometers, I will not dare to draw any conclusion on this world heritage. I also didn’t know this experience was special or not, but I was quite sure that walking up and down the hills for 7 kilometers was good for my health. At least my friend words were proved to be true in some part. Why on Earth is this inscribed as a separate site from Santiago de Compostela itself? So little of visual consequence was the UNESCO Web site apparently able to find along the route that it even uses a picture of the Cathedral at Santiago to introduce it! And then, of course, France has inscribed its part of the pilgrimage route separately (see my review) – making a total of 3 “Compostela” inscriptions in all. I would not argue against inscribing the pilgrimage route. So significant was the journey and so long did it take that it is studded by buildings created to support the pilgrimage but by splitting the objective from the journey (and by splitting even that into 2) UNESCO and Spain/France have, in my view, belittled the totality. And for what – political reasons no doubt? Yet the entire route in both France and Spain has been designated as the first “European Cultural Itinerary” so cooperation was achieved in that case – why not in UNESCO? Spain’s policy regarding WHS nominations has always been to “share out” its sites across its Autonomous Regions and the Compostela Route gives 5 of them a “share”. (Interestingly the 3 regions making up the Basque autonomous community of Euskadi are alone, as of end 2005, in having no inscribed site - it is said that the Basques have not, for political reasons, participated in the Spanish nominating council). The French Compostela route lists 69 selected buildings out of a possible 800 but the Spanish route follows a policy of inscribing the entire contiguous route from the 2 French frontier points to Santiago (and a 30 metre strip on each side!). This caused ICOMOS some problems (“It is difficult to evaluate given the criteria set out in the Operational Guidelines for the evaluation”) - but “guidelines” can always be ignored changed after the event if the political will is there! 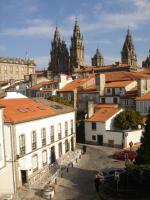 If you reach Santiago de Compostela overland from the East you will almost certainly have followed part of the route. However, unless you are doing the journey as your own personal pilgrimage, you are unlikely to stop off at more than a few of the many pilgrimage related sites (the inscription mentions that there are “some 166 towns and villages ….and 1800 buildings along the route”). Santiago is a long way west of the main tourist areas of Northern Spain but the Spanish part of the route commences far to the east on the French frontier and we drove that part out of the foothills of the Pyrenees from Jaca to Estella past the 11th century bridge at Puente la Reina (photo). We then left it to follow the coast and visit the Picos de Europa rejoining at Lugo (also a WHS for its Roman walls) for the final part to Santiago. I remember the enormous Spanish horizons and speeding past the small groups of pilgrims dressed in monks habits walking the entire route. Clearly we left a very large part of the Spanish route “unseen” but, if we do one day return to this area, I am afraid it will be to see the WHS at Burgos and San Millan rather than to follow more of the pilgrimage route. 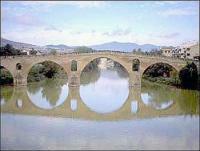 From "Routes of Santiago de Compostela" to "Routes of Santiago de Compostela: Camino Francés and Routes of Northern Spain"
Notable Bridges: Puente la Reina, Kingdom of Navarre tourist web site: "the Romanesque Kridge across the river Arga is the most amazing sight of all. It is one of the most beautiful and distinguished examples of Romanesque architecture on the way to Santiago and is what gives its name to this town"
Freestanding Bell Tower: Santo Domingo de la Calzada Cathedral, with its external bell tower. Pyrenees: The route starts in the Pyrenees at Somport and at Roncevalles, both part of this site. Linear inscriptions: It is not absolutely clear whether this site is inscribed as a series of point monuments or in the form of a "line". The AB eval states "The entire route from the French Frontier to Santiago itself has been nominated" ..... "At the present time a 30 mtr strip on either side of the route is protected"
Knights Templar : Ponferrado - Castillo de los Templarios, a Templar castle created after 1178 when Fernando II of León donated the city to the Templar order for protecting pilgrims on the route. Recommended for combination by AB: "ICOMOS suggests therefore that consideration be given by the relevant States Parties to the possibility of an eventual extension of the property to other lengths of the Route outside Spain"
Incorrect UNESCO 'Number of locations': Shows 20 (those of the 2015 extension), but these include 4 main routes and 16 individual sites that represent those routes. The 978(?) previously inscribed locations on the main route are omitted. Name changes: From "Routes of Santiago de Compostela" to "Routes of Santiago de Compostela: Camino Francés and Routes of Northern Spain"